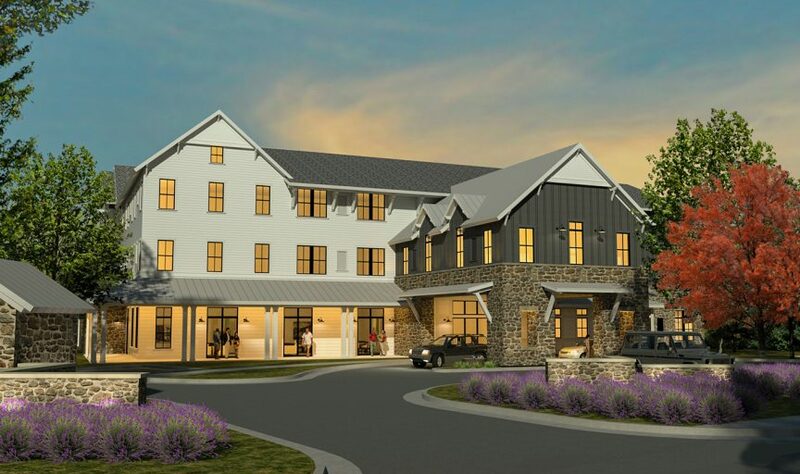 Balfour Senior Living has a strong presence and successful history in Louisville, Colorado, offering the full continuum of care ranging from independent living and various levels of assisted living, to memory care and skilled nursing. Landscape design has always been a vital piece to Balfour communities, and that is where the overall design of Balfour’s newest community, Lavender Farms began. The existing site layout and the adjacent properties aided in the overall placement of the site amenities. The northern portion of the site is designated for parking because of its adjacency to the “back of house” of an office building as well as the limited natural sun light it receives. The eastern portion of the site shares a common border in the form of a communal walking path with the residential community and is screened by a dense group of cottonwood trees to create a sense of privacy for the residents. A small walking path around the building leads to the central courtyard. The building organization is a “U”-shape around the grand south facing courtyard. The majority of public area program is located at the front of the building and around the courtyard to promote both a visual and physical interaction with the landscape. The inspiration for the architectural character came from farms and homesteads of historic Boulder County. The modern farmhouse style utilizes elements such as dormers, wrap around porches and broad overhangs along with the use of lap siding, standing seam metal roofs and aluminum windows to emphasize this agrarian architecture. The porte cochere creates an impact statement and carriage house feel for the building by utilizing the space above for units. The back and upper portion of the building are mostly residential units with brilliant views of the landscape, which promotes the connection with the outdoor environment. Creating an optimal outdoor environment was an important design concept for Balfour. The large south facing courtyard, adjacent to open space, offers a warm and inviting atmosphere for residents to enjoy a variety of activities. And a covered porch, flanking the north and west sides of the courtyard, creates ample areas for residents to sit and experience the fresh air. The concrete flatwork from the porch bleeds into the structured walks of the courtyard creating specific axes with the entrance into the great room and dining room. Two concrete walks leading from the dining room border a central fountain which provides just the right amount of white noise to create a tranquil environment, and structured row plantings of lavender provide beauty and therapeutic value. 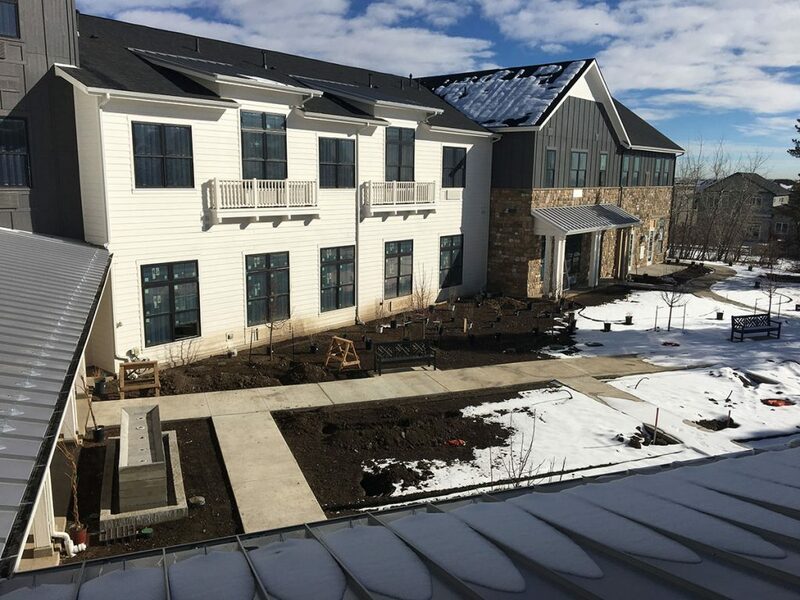 Engaging landscape integration into senior living facilities is a rising trend that is continuing to gain traction for all the right reasons. The reason for this trend is directly connected to maintaining a certain level of quality of life for residents that may have health or mobility issues and the connection to the outdoor environment is something that residents are looking for in senior living environments. These inviting outdoor spaces can be used not only for physical activity, but as gathering spaces that encourage residents to leave their room which has been proven as an effective way to help residents to avoid isolation and depression. Multiple studies have supported the claim that the spending time outdoors can contribute to the overall heath and wellbeing of residents. Dr. Roger Ulrich, a behavioral scientist who is widely known for his research on the impacts of healthcare facilities on medical outcome, states, “There is a pattern of evidence that suggests that well designed gardens can reduce stress, lower blood pressure and relax people. Also, there is research that shows experiencing nature and looking at gardens reduces pain. Nature seems to reduce pain by blocking stress and reducing the extent to which residents focus on themselves and their discomfort.” Additionally, a successful landscape design can promote physical activity in residents, which has been proven to help lower the risk of obesity which has been linked with dementia. There are many ways that facilities can take advantage of creating an active landscape design. One, is instituting a landscape care & gardening program where residents are given a sense of responsibility to keep their facility looking fresh and vibrant. Additionally, this allows residents to expand their knowledge regarding specific plant material and how it can be incorporated into our everyday lives. The gardening aspect can be incorporated into cooking classes where residents are a part of simple farm to table experience. The landscape can also be used for various exercise classes in the fresh air or a simple meditation garden where residents can use their senses to connect with the environment. Another benefit of successful landscape integration is directly connected to the plant material. The selection of Lavender for Balfour’s newest community was chosen for its therapeutic value. Lavender oils have been discovered to promote feelings of calm and help combat nervous tension. Through placement of these plants in the courtyard the residents can be exposed to these health benefits along with their natural beauty. And, Balfour will be exploring the idea of creating classes for residents to utilize the lavender. This is yet another way to create an active community that promotes the integration of landscape. Through providing an active outdoor environment for seniors, we can maintain a certain quality of life and help aid in their healthy lifestyle. These spaces encourage both physical activity and social interaction, which are vital elements for the overall health and wellness of residents. The integration of architecture and landscape continues to be an important factor in the success of any project, especially senior living communities.